While attempting to weed through the heaps of clutter that's been shoved into IKEA boxes over the years, I came across this old photo. 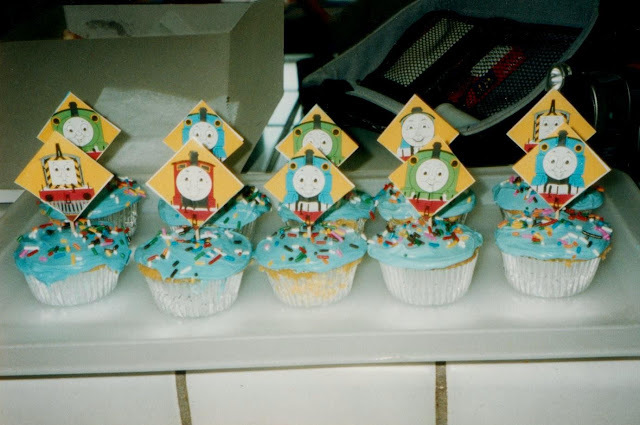 A blurry picture of my middle child's "Thomas" cupcakes back in 2003. Long before every craft store in town sold cute little picks for every occasion, a mama had to use what she had: stickers and toothpicks. Ten years later, NOTHING HAS CHANGED. Toothpicks and paper can transform from-a-mix cupcakes, a tub of premade frosting, and plain jane sprinkles into something that looks kinda special. I mean, it's no Martha Stewart magazine cover, but it doesn't scream random scrapbook paper scraps either. At least not loudly. 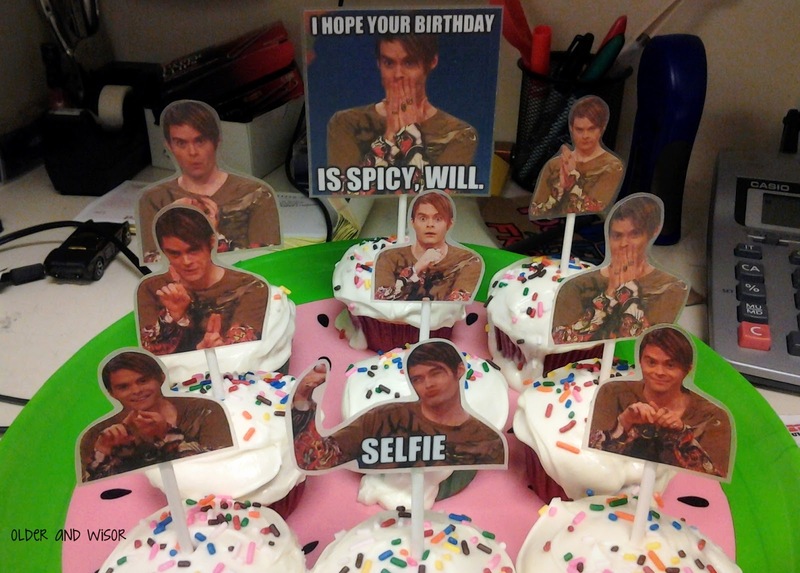 Sometimes you can even step it up a notch because you've got a fancy $29.99 Walmart color printer and can print your google swiped images in COLOR and it's Sir William's birthday at work and what would be more awesome than Stefon cupcakes? After cutting each shape out, they all got some fancy nancy dollar store (leftover) contact paper, since these babies are going to live long after the birthday balloons have fallen. My sense of propriety prevents me from sharing all the inappropriate places they've been discovered so far, but I assure you that the extra layer of protection and moisture resistance has been put to the test. Also, ten years later? I still take blurry photos.And don't refrigerate my cupcakes, which is something I would definitely recommended if you live in Texas and it's summer time. Luckily messy frosting is just another excuse to lick your fingers. Disclaimer: if you don't know who Stefon is, I'm not sure that we could be friends in real life. But perhaps you don't like to stay up that late? Which I suppose is an acceptable excuse. And in that case, here's a montage of all of his "reviews" on Weekend Update. Oh my gosh, these are so good. 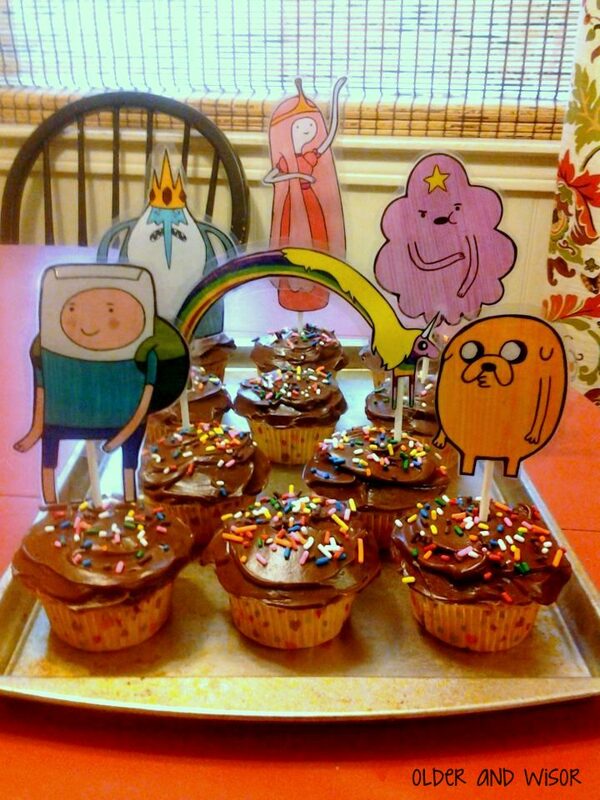 I love all your cupcakes. You decorate like I do. But I do not know who Stefon is. Thanks for posting the montage. Great post. I can't believe your icing actually melted off the cupcakes! And I din't notice the camouflage paper on the St Patty's cupcakes, if you hadn't told me. Glad you're still making special treats, I'm sure your family loves all that you do for them! A little bit of printing and fussy cutting can make all the difference can't it. They all look great! I wouldn't even want you to see the first birthday cake I attempted for my son, many years ago. It was soooooo bad and with his birthday being in August, it was quite melty and ended up so lopsided it wasn't funny.